Chamaedorea Elegans Family: Palmae/Arecaceae (palm family) Common Names: bamboo palm, Parlor Palm Chamaedorea elegans-Parlor Palm-The most popular cute miniature indoor palm plants in supermarkets and garden centers all over the world. Been grown indoors for hundreds of years. Native to rainforest in Mexico, Guatemala and Belize, it grows a solitary, canelike stem to about 2 m (7 ft.) tall, topped by a graceful crown of neatly pinnate, pale green leaves. Best suited for a shady spot indoors or in the subtropical/warm temperate garden. This particular species is more cold tolerant than other Areca Palms. 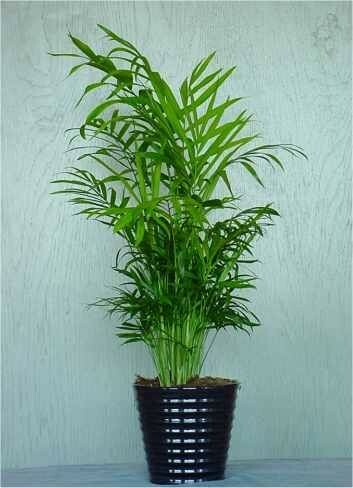 If grown in a small pot it's height will grow between 2-4 feet. A few of these in your home will keep your air clean and healthy.